Soldiers with physical disabilities participate in IDF Memorial Day ceremony in Jerusalem. Hundreds participated in a Tuesday night Memorial Day ceremony in Jerusalem’s German Colony. Memorial Day (Yom Hazikaron) commemorates Israel’s fallen soldiers and victims of terror. 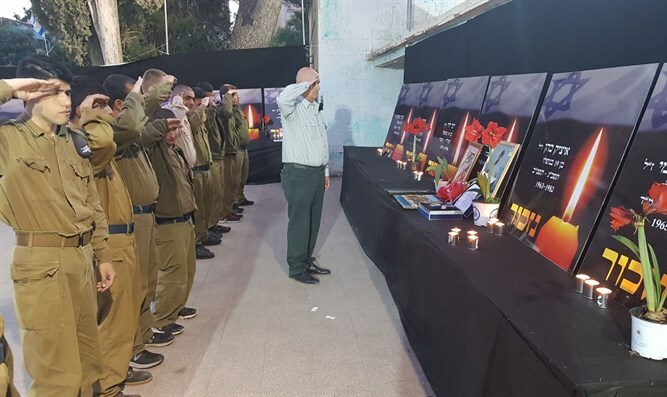 IDF soldiers from a wide assortment of companies marched in memory of the nation’s fallen soldiers and terror victims, and particularly moving was watching the volunteer Special in Uniform corps among them. Unlike many other countries, most of Israel’s wars have been fought on home turf. This, coupled with the fact that Israel is a small country with a population of only 8 million, contributes to the doleful reality that there is hardly an adult in the country who isn’t personally familiar with at least one casualty of war or terror. Michael Bibas, who marched in the ceremony, is currently in the volunteer stage of the program. Special in Uniform is a unique program operating in partnership with the Jewish National Fund (JNF) to integrate young people with a wide variety of disabilities into the Israel Defense Forces. The progra emphasizes the unique talents and skills of each individual, matching each one to a suitable job within the IDF and allowing participants to use their abilities to help keep Israel safe and secure.